You may have some big MP3 or other audio files which you want to trim, split to cut down its size for playing on your portable devices, like iPod, Creative Zen, iPhone, iPad etc. Or perhaps you have some audio files downloaded from internet and want to cut out the commercial parts. You may also want to use the particular portion of an MP3 music file as ring tone for your mobile phone. To clip or trim your music files, you should turn to our freeware – Any Video Converter Free, which is a smart but powerful enough audio and video converter and editor tool. As an audio splitter freeware, Any Video Converter can help you cut the audio files into segments as you like. And as an audio joiner, it will also help you join or merge any audio files into big one even though they are in different formats. This article will guide you how to cut or merge MP3/WAV/WMA/M4A/OGG/FLAC files with Any Video Converter Freeware. Any Video Converter is a completely free music converter and editor tool for windows users. You can simply download and install. Click on the Add Videos button and then you can add audio files into the free audio converter. Select and check files you'd like to merge. Any Video Converter support almost all video formats and audio formats as input. Except editing the source audio files, Any Video Converter can also extract audio track from video files and cut or merge the audio track and then save the audio as MP3, WAV, WMA, FLAC, AAC, OGG, M4A formats. Step 3. Turn the "Join All files" button to ON. In the lower right corner you could find the button. Or just simply check the audio files you would like to merge, right-click and select Merge All Files. Step 4. Start Merging audio files into one. Choose output format and click "Convert Now!" button to start merging audio files into one. Any Video Converter Freeware supports several common-use formats as output, like MP3, M4A, AAC, FLAC, WMA, WAV, OGG. And we are planning to add more audio formats in next version. After the conversion finished, the output audio files will be merged as you like. Step 1. Choose audio or video file you want to clip. Then click button to enter "Video Clipping" window. Step 2. Click Play button to start playing the video clip. Step 3. Click the Start Point and End Point to trim desired section. Step 4. Click New Segment button (NO.6), and repeat step 2 to trim another segment. Step 5. Click on trimmed segment, and click Play Segment button to play selected segment. Step 6. Click "Apply" to enable setting. Step 7. Click "OK" to return to the main window. Step 8. Check files you would like to convert and click "Convert Now!" button to start converting all checked files. 1 - Play/Pause: used to playback and pause audio file. 3 - Stop: used to stop playing audio file. 5 - Start /Stop Point: used to start and stop trimming audio clip. 9 - Scrubber Bar: The scroll bar lets you move to anywhere in either a segment, or the whole movie. 10 - Segments Pane: clipped audio segments are placed here. 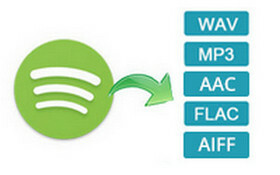 If you would like to convert Spotify songs to common audio files, you need the help from Spotify audio converter. Spotify audio converter is the audio converter that can help users download and convert any Spotify songs, album and playlist to common MP3, AAC, FLAC or WAV format, so that you could play them with your music player more freely. If you are looking for an audio converter that could convert iTunes M4P songs, then you should not miss this iTunes DRM Audio Converter. 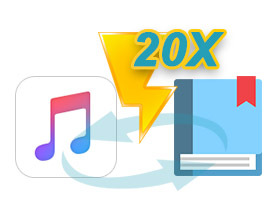 No matter you want to convert DRM-ed iTunes music or Apple Music, audiobooks, the iTunes DRM Audio Converter could do them all with 20X fast speed, keeping lossless quality, retaining ID tags.